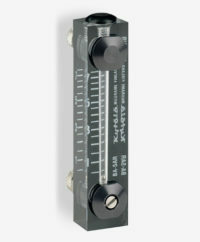 The Model BA variable area flow meter by Kytola is specifically designed for monitoring low air flow rates, up to 10 bar. Made from a high-quality acrylic (PMMA) with a durable aluminium housing, the Model BA features a flow adjustment valve and rapid fittings for plastic hoses with a 6mm outer diameter / 4mm inner diameter. This component is commonly used in differential pressure measurement, analysers and air purging for enclosures.